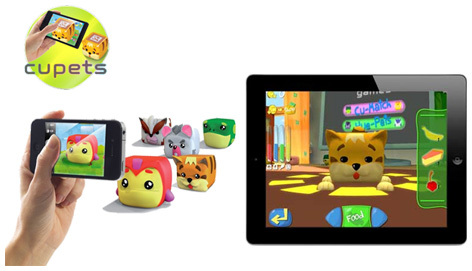 An increasing convergence and crossover between smart phone apps and toys sees the exciting launch of Cupets. These cute and individual little app toy characters can be brought to life on a phone or tablet screen once scanned by the device’s camera. Featuring twelve different cube-shaped collectable toys, each one has a distinct ability and personality. Cat is a naughty and mischievous kitten, whilst Bat is a clumsy and disaster prone creature! The iOS or Android app contains four different games working in two play modes. The running game has the ability for users to collect coins that can be exchanged for accessories to be downloaded from the Cupets world website. Other interesting characters include Wolf, Boar, Chick, Dog, Fish, Frog, Rat and Snake. Lots of other animals admire Turtle for his military style of authority, whilst Pig is a laid back guy who’s always cheerful even when things are going wrong all around him. Distributed by Flair in the UK, Cupets app toys are available from all great independent toy shops and online retailers. Please tell us what you think of the Cupets by Flair.